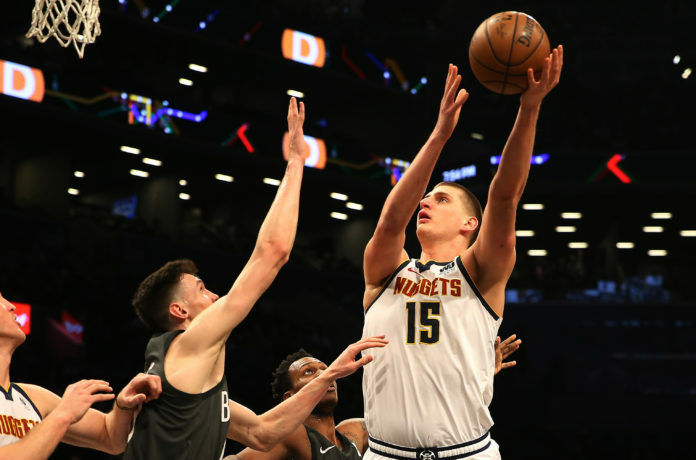 Nikola Jokic recorded his 10th triple-double of the season, but it was not enough as the Denver Nuggets suffered a 135-130 loss in Brooklyn to the Nets. Denver has now lost two-straight, but have still won eight of their last 11 games overall. With the loss, Denver’s record falls to 37-17, which moves them a game behind Golden State for first place in the Western Conference. When Denver and Brooklyn matched up earlier this season — November 9th to be exact — the Nets picked up a 112-110 victory at the Pepsi Center. At the time, it was Denver’s first loss at home as the Nets spoiled a 37 point and 21 rebound game from Jokic. Brooklyn was looking for a similar result on Wednesday night, while the Nuggets were looking for the exact opposite. The Nuggets already got some good news before tip-off as Jamal Murray was back after missing Denver’s last six-games with a left ankle sprain. The addition of Murray in the starting lineup rejuvenated Denver as they opened the game on an 8-0 run. 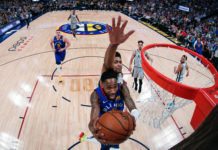 That run was highlighted by three-pointers from Will Barton and Murray as the Nuggets jumped out to an early 16-5 lead in the games first three minutes. Mason Plumlee really set the tone for Denver as he opened the game with 10 points on 5-of-5 shooting from the field to go along with his four rebounds. With Paul Millsap (right ankle soreness) out, Plumlee drew the start and it paid off for Denver as the Nuggets led 29-16 with 3:35 left in the first quarter. Plumlee finished the opening quarter with 14 points on a perfect 7-of-7 shooting from the field as the Nuggets held a 35-30 lead after 12 minutes of play. Denver’s once 14-point lead slowly dwindled on into quarter number two as the Nets opened the second on an 8-0 run. Brooklyn held all the momentum before Jokic subbed back in and started to take the game over. At the 8:17 mark of the second quarter, Jokic was already up to five points, seven rebounds, and seven assists as the Nuggets big man had a chance to finish with a first half triple-double. Even with Jokic playing well, the Nets still led as Denver trailed 51-49 with 5:32 left to play in the half. Brooklyn was in control for the final five minutes of the half as Denver trailed 72-60 at halftime. At the break, Denver was led by Plumlee, who had 14 points on 7-of-8 shooting from the field to go with his four rebounds. Jokic had a great first half as he finished with 11 points, seven rebounds, and seven assists to put him on triple-double watch going into half number two. Denver’s struggles carried on into the third quarter as Brooklyn opened the period on a 9-4 run. With the Nuggets now down 17-points, Denver desperately needed a spark if they wanted to walk out of Brooklyn with a victory. Brooklyn’s lead got all the way up to 21-points before the Nuggets subbed in rookie Jarred Vanderbilt, which provided instant energy off the bench. Vanderbilt was a rebounding machine before and after Monte Morris rattled off seven-straight points to cut Brooklyn’s lead to 91-79 with 6:16 left in the third quarter. With the lead down to 12 points, Brooklyn got hot once again to close the quarter as Denver trailed 108-89 after three quarters of play. It was definitely a positive quarter for Vanderbilt as he finished with seven rebounds in his seven minutes off the bench. The big quarters from Morris and Vanderbilt gave Denver a chance going into the fourth quarter, but it was going to take a dominating final 12 minutes off play if the Nuggets wanted to complete a monster comeback. Everything was trending in that direction as Denver opened the quarter on a 5-0 run to cut their deficit to 16-points. Brooklyn immediately did the same though to push their lead back up to 21-points with 9:30 left in the game. 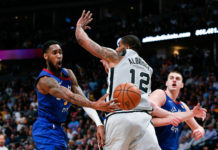 The Nuggets biggest issue as the game wore on was slowing down Brooklyn’s offense as the Nets finished with seven players in double-figures. D’Angelo Russell led the way for Brooklyn with 27 points that was highlighted by his six three-pointers. Even with their defensive woes, the Nuggets never gave up hope as their deficit was back down to 14-points with 5:42 remaining. Denver continued to fight as the Nuggets still trailed 130-120 with just under three minutes left in the game. That deficit got all the way down to seven points after Morris hit a free-throw with just over one minute remaining. It would be all for not though as Brooklyn hit their free-throws in the closing minute to secure a 135-130 victory over the Nuggets. Stat leaders for the Nuggets were Jokic, who had an other big game finishing with 25 points, 14 rebounds, and 10 assists for his 10th triple-double of the season. Plumlee also had a big night against his former team as he finished with 24 points on an extremely efficient 10-of-12 shooting from the field. 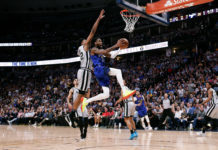 Other Nuggets’ who scored in double-figures were Morris (18), Malik Beasley (17), and Trey Lyles (15), while Murray finished with a double-double of 19 points and 11 assists. Denver will be back in action Friday night when they close out their four-game road trip against the Philadelphia 76ers.